**Please note that the 500mg strength is the same potency as the 250mg strength. The 500mg is a 2 ounce bottle and the 250mg is a 1 ounce bottle. Ingredients: Organic safflower oil and organic full spectrum CBD Oil which includes secondary cannabinoids, terpenes, and flavonoids. *Research shows that whole plant CBD products are more therapeutically beneficial than single molecule isolated CBD products. 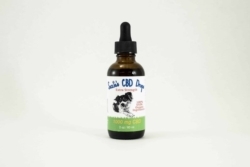 DOSING: 1 milliliter equals 8.3 milligrams of CBD. Please refer to dosing guidelines on FAQ for further explanation.